To convert fractions to decimals, simply divide the numerator by the denominator. Convert each given fraction to decimal. 1) Divide 3 by 5. 2) Divide 12 by 19. 3) Write 3 before the decimal point. To obtain the decimal digits, divide 35 by 90. 4) Write 2 before the decimal point. To obtain the decimal digits, divide 1 by 6. 5) Divide 5 by 20. Key-in each given fraction. 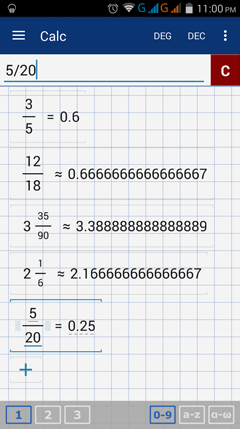 The calculator automatically displays the equivalent decimal form on the screen. Tap the enter key to type another fraction. Recall that to enter a mixed number (a fraction containing a whole number and a simple fraction), we type it following this order: whole number, space bar, the numerator, fraction key, denominator. The equivalent fraction of each of the five decimals is shown below.